The launcher window is used to prepare IVAC2 for use. The above are remembered for the next time you run IVAC2. FIR : Which flight information region (FIR) do you wish to control/observe. IVAC2 data is grouped together by FIR, so you must choose an FIR first. Search : Anything you type will narrow the choices visible in the list of FIRs. You may search by ICAO code, country code or the name. Load : Clicking the button will transfer the FIR data for the selected FIR from the server to your computer. The name of the FIR will be highlighted in yellow for all FIRs that have already been loaded. Double-clicking on the FIR row in the table does the same as clicking the load button. Delete: Data for the selected FIR will be removed from your computer (the name will change from yellow back to white). 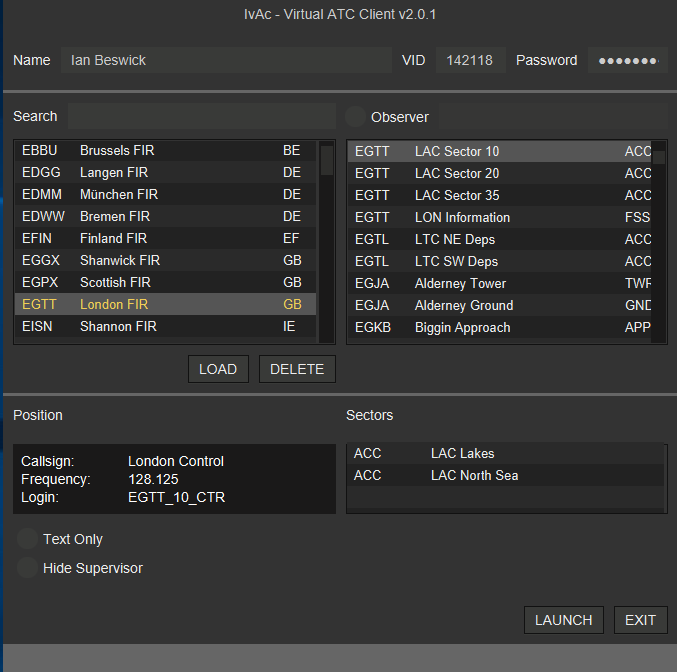 Observer : If you only wish to observe the radar rather than control, click the circle and choose your observer callsign (should end with OBS unless you are connecting with a staff callsign). List : Selecting from the list will configure IVAC2 read to control that position. The ICAO code, position name, and type are displayed in the box. Position : Whatever position is selected on the right-hand box will have more details displayed here, including the radio callsign, communication frequency, and network login name. Sectors : Some controlling positions may be made up of several sectors. Currently there is no further selection possible here; future versions may enable one or more of the sectors to be selected from controlling. Text Only : If you will not be using a voice client (eg. TeamSpeak) to communicate with other network users, then click the circle to indicate that you are only using text to communicate. Hide Supervisor : If you are a network supervisor, but do not wish your supervisor status to be displayed during this session (eg. you are going to be controlling busy traffic and will not have time to answer WALLOP requests) then tick the circle. Launch : Do some controlling! Exit : Don't control now. Settings will be remembered for next time.